Whether it is simple online credit card fraud or a DDOS attack taking down a government system, cyber attacks are quietly gaining in frequency and impact. The power of the keyboard is only growing as we store more and more private data in computer databases. Our interconnected society is allowing criminals next door or across the world to steal your identity and steal from unsuspecting victims. Even large businesses are not above this risk, with several high profile hackings, and many more ‘under the radar events’ occurring more and more frequently. Cyber Attacks have a very large range of severity. It could be malicious malware on a computer you hardly use, or it could be a series of coordinated attacks carried out on banking sites and servers. While cyber attacks do not directly threaten life and limb, they are a particularly effective attack against society. For a cyber attack, it doesn’t matter if you are thousands of miles away, protected in your own home, or even speaking a different language- they play by a different set of rules. The bottom line is that our system is vulnerable and the most severe cyber attack could result in financial collapse or even worse. Yes. We all know the Terminator scenario of us inventing our doom with Artificial Intelligence (AI). While that seems far fetched, we are actively working towards understanding artificial intelligence, and we are relying on interconnected computers more and more every day. Some of us now have smart home devices constantly listening in our homes. Most of us have smart phones that can be controlled remotely. AI is not all that could attempt to shake the foundation of our interconnected society. Election hacking and government leaks have become a common discussion point in many homes. State sponsored hacking is known to exist and have been used by North Koreans, Russians, and Ukrainians- the list goes on. Our inter-connectivity advancements look to be outpacing our cyber defense initiatives and our ethics. Coordinated attacks could easily cripple societies, crash economies, or cause the end of the world as we know it. 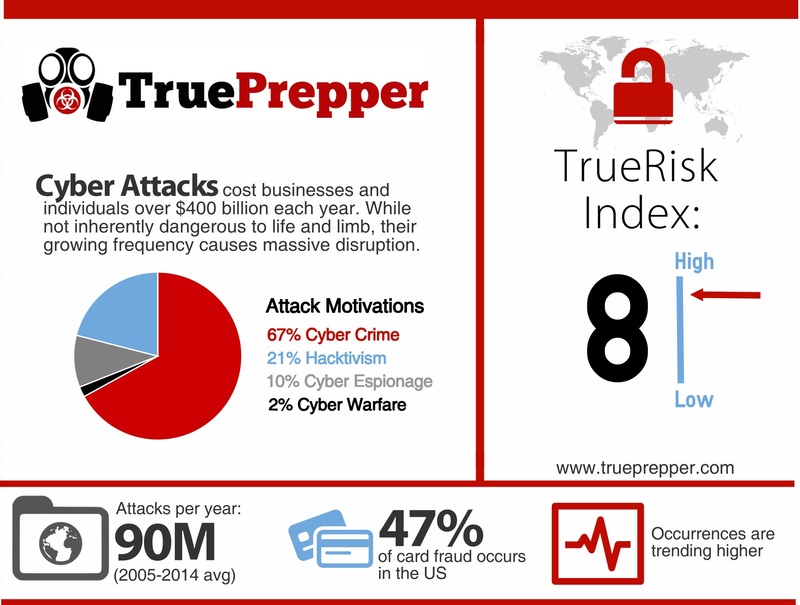 Our risk analysis for a Cyber Attack resulted in an 8 on the TrueRisk index. You might be asking yourself or in the middle of typing out an email: “Why?” The answer is all around you in cyberspace. Most of the people accessing the internet are not as secure as they would like to believe. Your IP address (and all the information that comes along with it) can be easily monitored. Companies that store credit card data are increasing ‘misplacing’ this information. Government databases and emails are being mishandled and leaked. It is so easy to extract information that does not belong to you using the internet that you could even accidentally acquire other people’s information. Your cyber attack risk is in your control, and is proportional to how much you expose yourself and your data online. Being familiar with scams, identity theft schemes, and safe credit card usage online can reduce your risk. Prepping to prevent cyber attacks is mostly done through learning, planning, and good habits. While there is some gear that can help you out, most of the work is done by what you choose not to do. Over sharing online, downloading unverified files, and frequenting unsecured websites can all set you up for failure. While all of this helps for personal attacks, prepping for large scale cyber attacks is the same as you would for any type of infrastructure failure. Adding a RFID blocker to your wallet/purse is never a bad idea. Keeping a password encrypted USB drive with personal data in a safe can help as well. Lastly, a smart phone is a great tool when used properly and vulnerability when it is not. Most of these would be carried on your person and part of your Every Day Carry Kit. If a large scale cyber attack were to cause a ‘grid-down’ scenario or economic collapse, the standard prepping kits we suggest for those would come in handy. As we mentioned before, the best plans for cyber attack avoidance is to not go to sketchy websites, don’t download viruses/malware, and to not over share personal information online. Being stingy with online card use and keeping strong passwords can also bolster your online security. For a large scale cyber attack, plan for the cyber attack being the first domino in a string of infrastructure failures. Power outages, economic collapse, and even military action could result. Mitigating the effects of a cyber attack is all about timing. If you are lucky enough to receive notification that your data or accounts are compromised, you may be able to mitigate some of the damage. You should immediately call the company where the attack is occurring if you are able to. Unfortunately, if it is a large scale attack on infrastructure- there is not much to do except to stay informed of the next steps. Retaliation and the long term effects of the cyber attack are usually much worse than the attack itself would be to you and your family. If the attack was a personal cyber attack, such as targeted identity theft, there is much work to be done. If the cyber attack was large scale, you will be dealing with the domino effect of it through other issues and threats. Learn how to recover from power grid failures, economic collapse, and military action all as possible results of cyber attacks.